These projects have included corporate campuses, inside and out… both flooring and hardscape, office lobbies, providing a bright welcome, and complete office footprints, and institutions, from elementary school patios to complete university buildings. 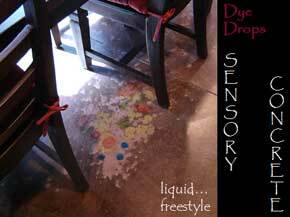 Our sensory concrete is great for restaurants and bars! It’s also great for retail… from hole-in-the-wall hip boutiques to very large super markets. We specialize in market floors, most often providing a themed experience, with some element of sculptural or applied art, or both. 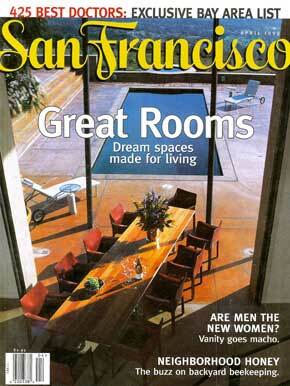 We have installed market floors throughout America, including north, in Canada, and South, in Mexico. Our mission is generally to provide sturdy, practical paving that also supports the client’s vision for the space and contributes to the “sense of place.” We’ve also been involved in theming projects including complete shopping malls (one, alone, was over 500,000 square feet! ), hotel/casinos (such as Caesars Palace, in Las Vegas) and theme parks (in the United States and abroad). This plaza is designed to be an inviting approach, a place to pause, and to direct visitors to the corporate offices within. Graphically, the piece is designed as an inverted root system, growing and becoming stronger as it radiates outward. The root system continues through the doors into the building lobby, suggesting a direct correlation of indoors to out, and diminishing its transition. 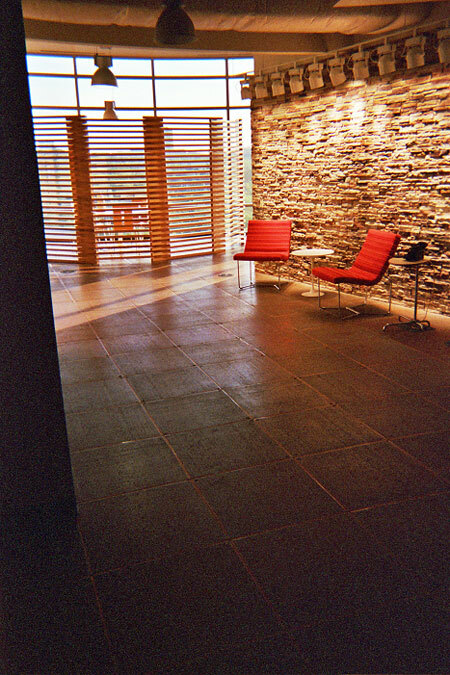 The floor for this spa was a simple colorist project, composed of multiple layers of skimcoat, troweled to produce gentle highs and lows, each layer a discrete complimentary color. These layers were ultimately sanded back, accentuating these highs and lows and creating a rich, leathery, marbled appearance. 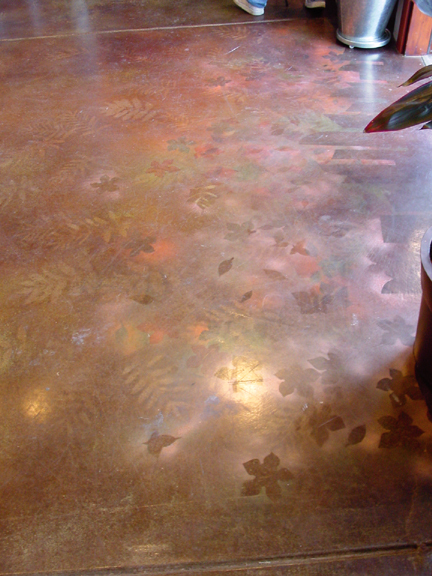 We turned the previously green stained floor of this urban gardening store into a deep mahogany color enhanced with random leaf graphics for a forest floor feel. Green architects Burton-Tahara designed the massive “potting bar,” the base of which was built using eco-friendly resins and composite materials. For the sculptural concrete component and bar top, our preferred material was actually multiple skimcoats applied over a constructed frame and finished to a fine texture. 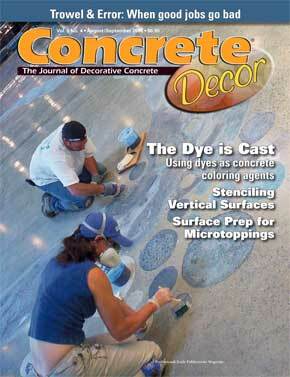 This had some advantages over a solid concrete counter, including a seamless finish, and much lower cost. After removal of the old VCT for this market remodel, clearly, the original concrete floor was in awful shape and we determined that it was in everyone’s best interest to skim the floor… providing a fresh blank canvas. Rather than work with color chips and sample references, our client provided us with a single word or simple phrase, followed by a brief descriptive poem for each area of special emphasis. 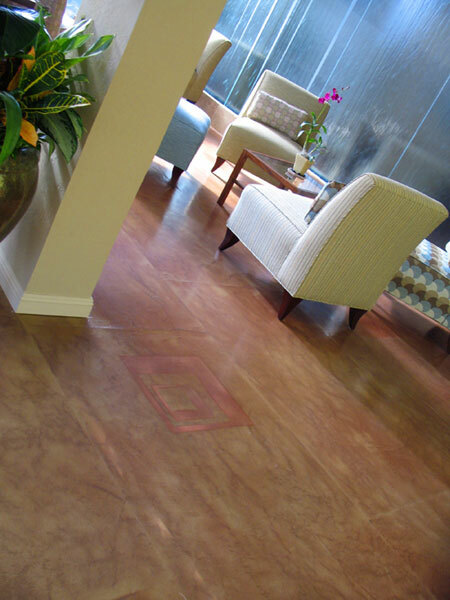 The skim base was integrally pigmented with a very light color. 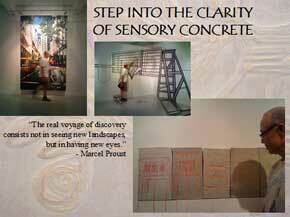 We conceived the design on paper in watercolor, then followed through by applying transparent dyes and ultra finely divided tints, with very large brushes and with water as the vehicle, to the slab, as to a giant watercolor. Very cool to look at and lots of fun to do!!! 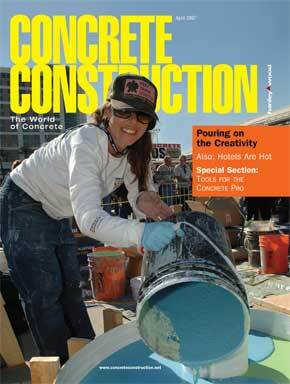 Concrete Construction Online is devoted to the concrete industry. 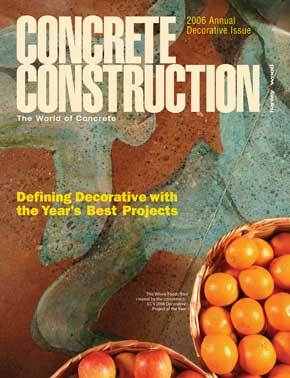 Through this web site you will find feature articles from CONCRETE CONSTRUCTION magazine and more than 2,700 additional news sources, new product information, sourcebook directories, and an open dialog to seek advice from fellow pros.